Architecture, and specifically the practice of architecture, is often studied by looking at historic precedents—how things were built, their context, and their meaning in culture. While having a good understanding of past influences is important to a successful architectural project, the ability to look forward—to understand future trends and influences, and to cultivate flexibility in anticipation of the new thing we can’t yet imagine—is equally essential. In the twenty years since my first job in an architectural office, I have seen waves of technological disruption from 2D CAD to BIM and SMS to online video collaboration. Who could imagine that smelly blueprints would give way to futuristic mobile, paperless studios? While technology has changed the way we communicate with each other and our designs have become simultaneously more complex and accessible, I find it curious that many contemporary architectural firms are still rooted in a traditional professional services model structure—focusing on delivering design services only within the conceptual design to construction administration spectrum. How is it that architects can be so expressive and innovative in design, and frankly so limited in how they design the structure of their firms? Architects who best understand and communicate their value proposition will lead the profession to develop innovative ways of thinking. 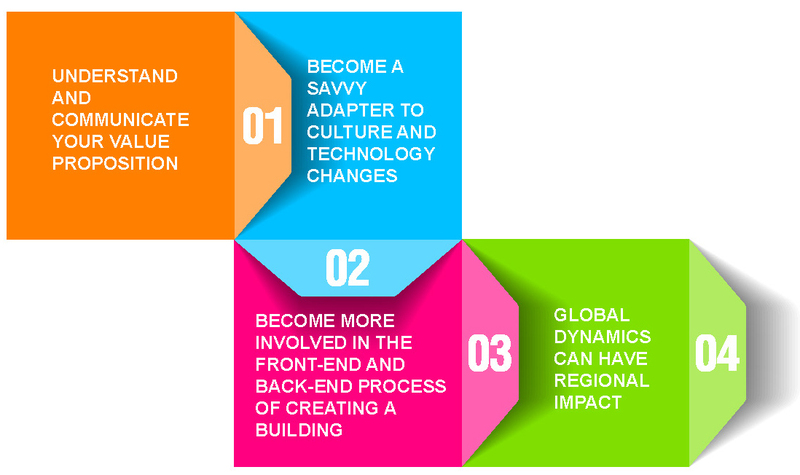 Architects must become savvy adapters to cultural and technological change to stay relevant. Architects who become more involved in the front-end and backend of the process of creating a building (e.g. visioning, financing, development, life-cycle analysis, and data collection) will be less reactionary and more proactive in both crafting the problem and the solutions they solve. Architects will need to understand global dynamics, even in regional markets. Technology has changed our transactional distance; therefore architects must adopt broader thinking beyond regional limits. Every successful business hinges on the fundamental customer value proposition—an offering to solve a problem or fulfill a need for the customer—defined by both what service is provided and how it is provided. Architecture’s value proposition is unique in that it can be enhanced through finding new ways to innovate inside the profession by changing our in-house design process and expanding the range of services offered, but also in the larger demand for services through new delivery channels connecting architects to clients and creating new strategic collaborations and enterprise demand for services. Financial and creative success will come to architectural firms that take a critical look at how they do what they do, how they connect to the demand for their services, and how and when those services are accessed. What other ways can I make money though a product or a service? Can I provide allied services for different constituencies? What other partnerships or collaborations could I develop? How might it add value to what I do? How could my organization change considering talent, management, and access to key resources? How can I effectively leverage my unique capabilities to differentiate myself in the marketplace? Architects who develop the ability to anticipate cultural and technological changes will successfully lead the profession and differentiate themselves from their colleagues who are slow to change. The profession has already seen consolidation of steps in the design and delivery process through the introduction of new technology and shifts in client expectations. Just as client-architect contract documents are be reviewed for each new venture, the process and delivery of services should also be assessed, updated and improved. Current trends in the profession creating disruptive innovation include the sophistication of design and management technologies; integration of design and fabrication processes; marketplace globalization; increased project complexity requiring greater levels of collaboration; scale shift in large firms doing small projects and small firms doing large projects; technology-enhanced virtual offices; flexibility in access of services; emphasis on workplace diversity; data-based design; acceleration of value delivery; and architects positioned to be experts in the sustainability and resilience conversation. While brainstorming future trends can be quick and exciting, adapting a business model can be an iterative process that will require tweaks along the way. Architects who provide vision-driven services that solve the problem of how to make the process of doing something more efficient or better fulfilling the anticipated needs of their clients will lead the marketplace in both creating a vision of the future and providing unique value for their services. How can I expand the features of my design services? How are my client’s requirements changing and what improvements can I offer? How can I provide complementary or additional services? What packages of services will clients need? How can I enhance what I do with new functionality, interactions, resources, promises, or connections? How can I continue to see change as an opportunity and not as a disruption? Architects are in the business of solving problems, or as Art Gensler, FAIA states, “architects sell solutions to our client’s problems.” Unlike a business that just sells goods, architects sell their stories, ideas and the product of what they design, but their value proposition is also tied to the outcomes of the process of design. This distinction is important because it provides a unique opportunity for architects to expand their range of services addressing both pre-design conceptualization but also evidence-based outcomes of architecture. In my research, I have found that many of the emerging non-traditional business models share a focus on either the front-end (e.g. community organizing, development, visioning) or the back end of the design process (e.g. commissioning, management, life-cycle analysis, outcome-based feedback, data collection). These examples present unique opportunities for architects to expand and distinguish themselves as experts in the built environment and society. Other benefits to focusing on pre-design services include better engagement and utilization of design thinking towards solving problems outside of the scope of traditional architectural services; while benefits towards focusing on post-occupancy services include continued contact w ith the client, capitalizing on existing relationships and trust. Understanding that the influence of an architect extends beyond the buildings we conceive, architects must grasp the opportunity to influence patterns of thought, action, and collaboration in practice beyond their current involvement. differentiate, expand, or improve upon my brand? or different parts of the client’s organization? Embracing the architecture firm of the future will require architects to ignore the status quo and use their ability to design their business just as creatively as they approach designs for the built environment. Keeping in mind that change is an opportunity, architects have both the skills and the vision to lead cultural and environmental change, one business at a time. This post originally appeared in the YAF Connection State of Practice Issue 1304.